One month into 2019, and it’s already looking like this year is going to be a defining one for the smartphone industry. Punch-hole displays, foldable phones, 5G networks (might not happen in India within this year, though), 48-megapixel rear cameras – we should see a ton of innovations and exciting features over the next few months. The month gone by did give us a glimpse, with the launch of handsets such as the Honor View 20 (review). But the more important question is which devices continued to hold consumer interest in the month of January. As always, we’ll turn to our list of most-searched smartphones on 91mobiles.com for that, and here’s what we found out. Xiaomi continued to sit on the throne with its quad camera-toting Redmi Note 6 Pro, but it’s the phones sitting on the second and third spots that are quite interesting. Both the Honor 10 Lite and Huawei Y9 2019 were introduced in January itself and have found a place among the table toppers. Samsung’s first triple rear camera smartphone, the A7 2018 (review) – possibly due to the price cut – has jumped up two positions to find the fourth seating. The Realme 2 (review) on the other hand, has slipped in popularity slightly as it’s now sitting on the fifth post, down from the fourth place that it got in the month of December. 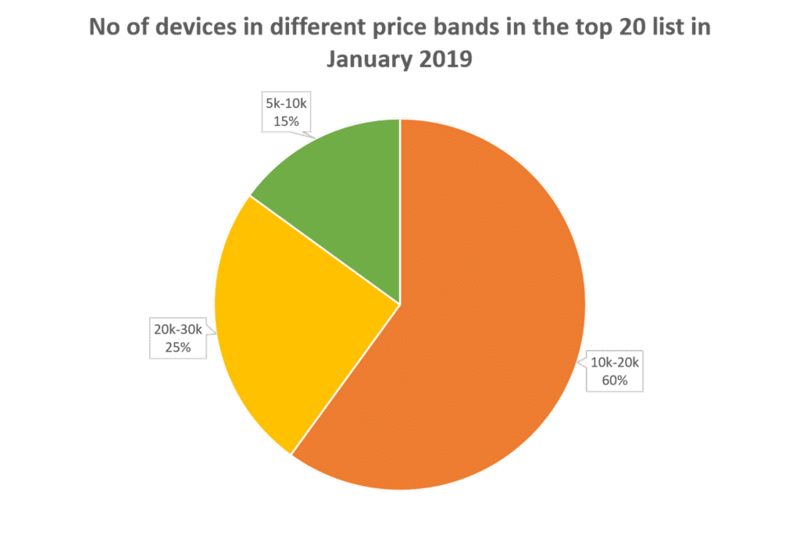 Apart from the top 5 handsets however, the list of the top mobile phones in January 2019 hasn’t seen many changes. Most of the smartphones have simply shuffled their positions. 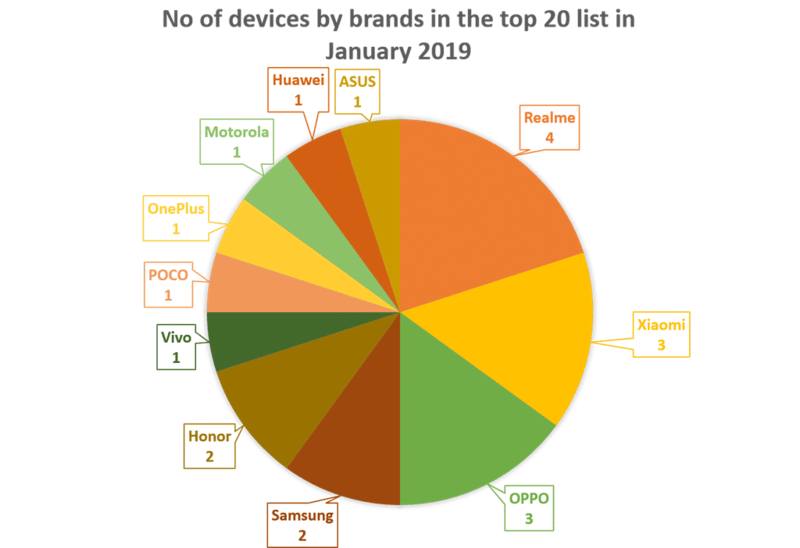 So let’s take a look at the entire list of top 20 smartphones, wherein alongside the phone’s name, we’ve also mentioned the change in ranking (when compared to popularity levels in December), price segment and the month of launch in India. The successor to the popular Honor 9 Lite (review), the 10 Lite (review), is a loaded smartphone in the affordable segment with a 6.21-inch waterdrop notch-toting display and a powerful Kirin 710 processor. The smartphone also offers an appealing gradient design and offers dual 13-megapixel and 2-megapixel shooters on the rear along with a 24MP selfie snapper. Powering the show is a 3,400mAh battery. While Huawei focused more on the upper mid-range and premium segments in 2018, it seems that the company aims to cater to budget-conscious buyers as well. The Y9 2019 (first impressions) is priced at Rs 15,999, and offers all the features you’d expect in a mid-tier handset – a large 6.5-inch display, powerful 12nm Kirin 710 SoC, dual-camera setups on the rear and front, and a beefy 4,000mAh cell. The F9 was launched in September 2018 and has caught user attention once more thanks to the recent price cuts. The smartphone offers a 6.3-inch display with a tiny cut-out atop and full HD+ resolution. The device comes equipped with the Helio P60 chipset, which is mated with 4GB of RAM. For imagery, the phone offers a combination of 16MP + 2MP sensors on the back, and a 16MP shooter on the front. While the tug of war was happening between Samsung and Xiaomi over the past few months, Realme has seemingly come out of nowhere and has turned the competition landscape on its head. 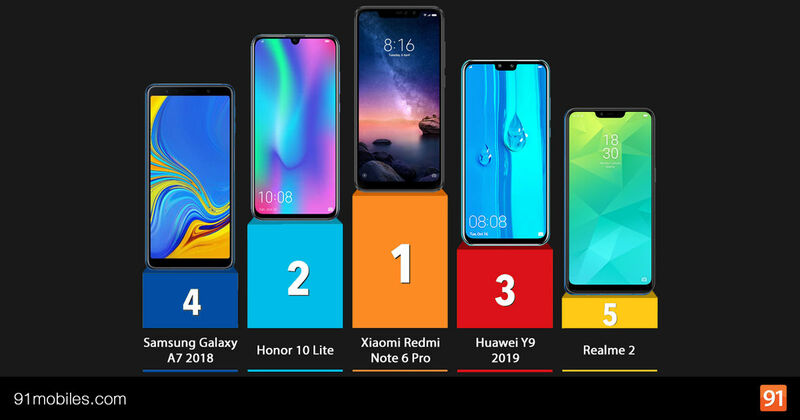 As many as four smartphones from Realme were among the top 20 most popular phones, closely followed by Xiaomi with three of its offerings. While Samsung wasn’t far behind, it’s interesting to see that even OPPO had more devices (three) in the popularity charts. Contrary to popular belief that the smartphone market in India is budget-oriented, we’re increasingly seeing that buyers are interested in moving up the value chain. The past month was a great example of the same as not only the mid-budget segment between Rs 10,000 and 20,000 is dominating clearly, but even the upper mid-range category between Rs 20k and 30k has gained more popularity than the sub-Rs 10k range. Since the year has just begun, it’d certainly be interesting to see how things change over the course of the remaining months. We’ll certainly be bringing you all the analyses and insights, so keep an eye out.